Lorenzo Codogno and Mara Monti take a bird’s-eye view of banking problems in Italy, which started mostly as a fall-out from the sovereign debt crisis and the deep economic recession that followed. Policymakers and bank managers underestimated the consequences of the crisis, and the policy response was slow. New banking regulations did not pay much attention to Italy’s specificities, and thus worsened the situation. The crisis exposed banks’ weaknesses, especially on the governance side. The next recession may hit before Italy adequately addresses remaining vulnerabilities. Ten years since Lehman and the financial crisis, the main questions on the table are whether the world has learned the lessons and what could be the source of the next financial crisis. The risk of a new recession in Europe, the end of Quantitative Easing by the ECB, and the spread of populism and Euroscepticism has put Italy back in the spotlight. 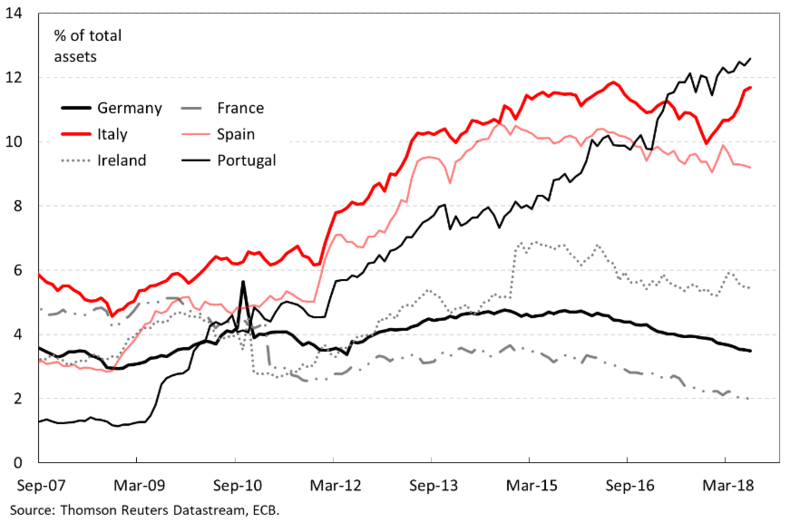 The Eurozone’s third-largest economy is in a fragile position compared to other peripheral countries such as Spain, Portugal and Greece, which have largely recovered since the outbreak of the sovereign debt crisis. The sentiment is still feeble, economic growth is at the lower end of the range of EU countries and government bond yields have risen since March, when the elections resulted in a new government led by the populist Five Stars Movement and the League. The transmission channel of a possible new crisis is still the banking sector because of the sovereign-bank link, which has effectively remained in place since the last crisis. The Eurozone government debt crisis started in 2010 and with that the problems of Italian banks. It was the delayed unfolding of the global financial crisis hitting peripheral Europe. It touched specific weaknesses of the individual countries and the vulnerabilities of an unfinished European project. With poor economic performance in the years preceding the crisis and a very high debt-to-GDP ratio, Italy quickly became the focus of the financial markets’ attention and a threat for the stability of the whole Eurozone, given the size of its economy and public debt. Investors started to question Italy’s ability to repay its public debt. They sold government bonds, and yields moved higher threatening to confirm the fears and make the crisis a self-fulfilling prophecy. Compared to other European countries, Italy did not experience a collapse in real estate prices as in Spain, a banking bailout as in Ireland, or an unreported rise in the deficit as in Greece. Before 2007, Italian banks were mostly focused on their domestic market, with 80% of their activities in Italy and moderate exposure to international markets. In 2007-2008, the spread of financial instability from the United States undermined the soundness of the European banking sector, but Italian banks were only indirectly affected, sheltered by a business model that was mainly focused on traditional commercial banking activities. At the peak of the crisis in 2011, there were worries about the sustainability of Italy’s public debt, but there were no serious concerns about the financial stability of the banking sectors. Nevertheless, some banks, especially those with operations across Europe, already in a weak position or financially overexposed, started to have some difficulties. However, the most severe impact came from the banks’ role as lenders to the government via bond purchases. They had one of the highest exposures among the major European countries (Figure 1). The stock of government bonds in the portfolios of Italian banks moved from 182.9 billion euros at the end of 2007 to a peak of 463.9 billion in May 2015, according to ECB data. They increased again to another peak of 472.1 billion in June 2016. Then there was a slow decline in the stock, settling at 379.5 billion in December 2017. In 2018, the stock increased again and reached 435.5 billion in July. These figures include all the government securities held in the portfolios of Italian banks, but the doom-loop of the sovereign-bank link is more specifically related to the position held in Italian government securities. According to Bank of Italy data, this latter stock moved from 160.0 billion in December 2007 to a peak of 426.3 in June 2013. It declined to 333.5 billion at the end of 2017 and was 387.5 billion in June 2018. Part of that is related to the banks’ decision to reduce loans in favour of perceived-safer government bonds during the economic crisis, part is due to the financing operations of the ECB, which required a sizeable amount of collateral. Still, as of today, the doom loop is very big and very much alive. When the crisis unfolded, and government bond spreads widened, banks also suffered from a de-facto closure of the Eurozone interbank market and the related difficulties in funding their financing gap. Then, all this weighed on the stability of the Italian banking sector and some of these problems are still present today. In the first wave of the crisis, with the outbreak of the Lehman Brothers’ case in 2008, Italian banks adopted a very conservative credit policy, increasing their portfolios of liquid assets with the lowest risk (i.e. investing more in government bonds), and reducing their exposure to clients with low ratings and their overall lending. The perceived higher lending risk translated into higher spreads versus money market rates and prompted banks to ask their clients for increased guarantees and collaterals. The reduced supply of credit and the higher perceived risk increased the cost for borrowers, especially for small and medium-size enterprises. In 2011-2012, the situation precipitated. The Italian economy experienced a quasi-credit crunch mainly caused by a supply-side shock in bank lending: credit was sharply reduced as a reaction to liquidity problems and a risk-averse attitude. 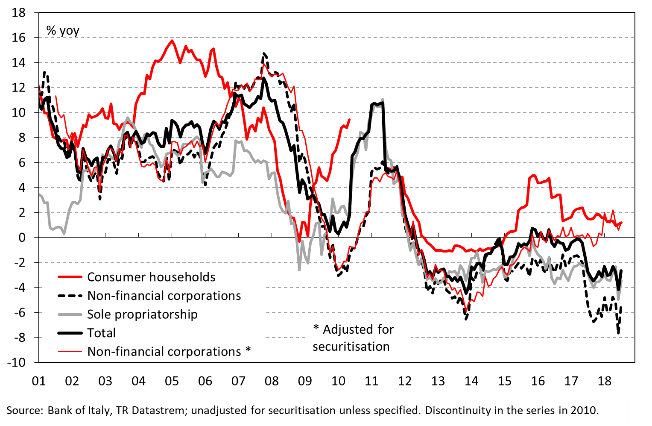 The quasi-credit crunch (Figure 2) inevitably contributed to the massive contraction in the economy. The dominant role of banks in financing the Italian economy and the relatively underdeveloped capital market (bond and equity) contributed to amplifying the credit problems during the crisis. The curbing of bank credit forced companies to scale back their investment plans and households to reduce consumption, increasing and extending the adverse effect of the shocks to the real economy. Addressing banking problems in earnest was a plus for the European Union countries that did it. The first massive intervention occured right after the US-induced shock in the financial markets following the sub-prime crisis. Except for contingent liabilities, interventions consisted of deficit and debt increasing. Impaired assets resulted in substantial capital needs to address the losses, and capital was raised more or less swiftly in 2008-2009 and affected mainly Germany, the UK, Ireland, Belgium, the Netherlands, Denmark, Luxembourg, Austria and to a lesser extent France. Government intervention to support the banking sector in the initial stage of the crisis was indeed massive, but early intervention seems to have slightly reduced the negative economic impact of the crisis and allowed a quicker recovery in credit. The second wave of banking problems started with the Greek crisis and affected state aid, deficits and debt, mostly from 2011 onwards. Government intervention was much smaller in absolute terms, but sizeable if considered in relation to the GDP of the countries affected. Deteriorating public finances and a negative feedback loop between sovereigns and the banks severely constrained any possible intervention. In parallel, European leaders said “never again” and decided to try to break this link. This aim led to the re-introduction of state aid rules in the summer of 2013 and then of the Bank Resolution and Restructuring Directive (BRRD), which became effective in January 2016. Since then, the attitude has changed, and the European framework has developed in the direction of shifting the burden of any future crisis toward investors and depositors. The possibility of government intervention has become much more constrained. In Italy, policymakers and banks did not recognise promptly enough the fast deterioration in non-performing loans (NPLs), as well as their effect on lending and the broader economy. Moreover, the high debt-to-GDP ratio limited government intervention. As a result, the situation continued to deteriorate until 2016. At the end of 2016, the Italian government allotted 20 billion euros to set up a fund for intervention to help banks through various instruments. De facto, this injection of public funds addressed the leftovers of the crisis and the lagged impact on NPLs. In the meantime, the economy improved and banks worked more diligently on their NPL positions. Banking problems in Italy required substantially less public money than in other countries, but the smaller and delayed intervention came at a price. The critical aspect of the Italian banking crisis is the exposure of retail investors to junior and senior bank bonds. Italian savers held about 29 billion euros in subordinated bank bonds as of the third quarter of 2015, i.e. before the BRRD came into effect. 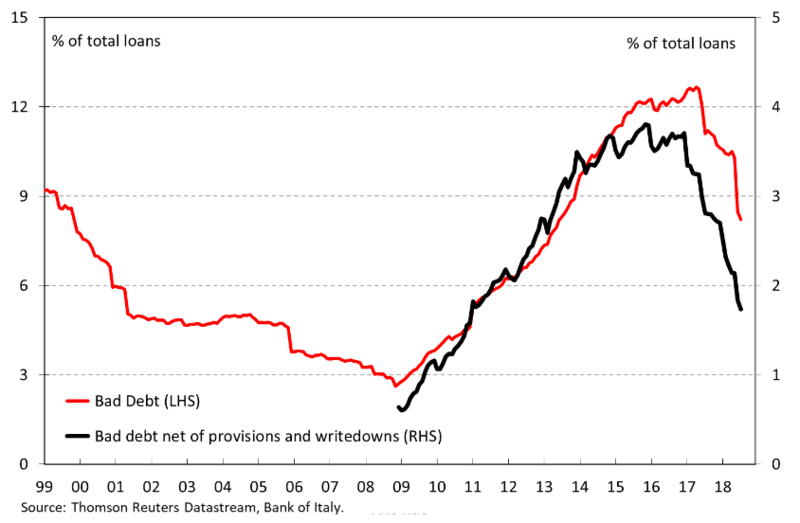 Italian households held more than 70% of the total stock of outstanding bank bonds in 1998, a percentage that declined to 21.2% in the third quarter of 2017. 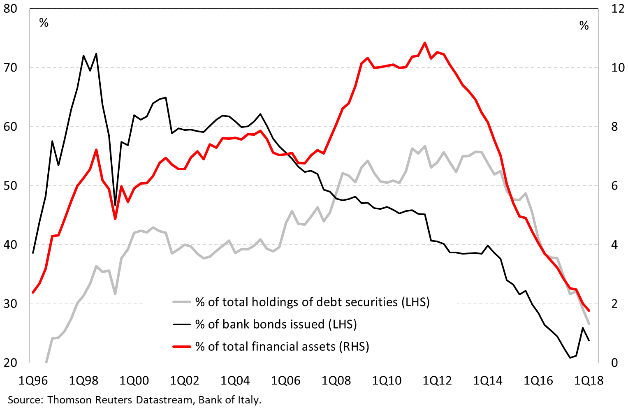 Households’ holdings of bank bonds reached a peak as a percentage of their total financial assets (10.8%) and their total debt securities (56.7%) in the third quarter of 2011 (Figure 3). Selling junior bonds to retail investors was a way for Italian banks to access cheap funding during the financial crisis. Between July 2007 and June 2009, 80% of Italian bank bonds were sold to retail investors. Many investors may not have fully understood the risks they were taking. Banks benefitted from the information asymmetry relative to their clients by placing risky bonds at relatively low yields. With the introduction of the BRRD, Italian retail investors suddenly discovered they were exposed to very risky assets, in the absence of an adequately extended transition period or grandfathering, i.e. exemption from the new regulation for outstanding bonds. The fundamental idea of shifting the burden of bank restructuring and resolution from the government to private investors was correct, but the lack of a sufficiently large pool of bail-in-able bonds beyond those held by retail investors made Italy an exceptional case in the European context. With hindsight, the transition toward the BRRD should have been more gradual, or at least it should have taken into account the specificities of Italian retail investors’ exposure to banks, i.e. there should have been some form of grandfathering. The three major groups of banks, characterised by three different governance structures, reacted to the crisis in different ways. Cooperative banks (banche popolari), representing the second largest group in terms of number of employees and branches after the commercial ones (9.4% of total loans in December 2017), increased both branches and employees despite the rise in their NPLs, thereby putting pressure on costs and profitability. 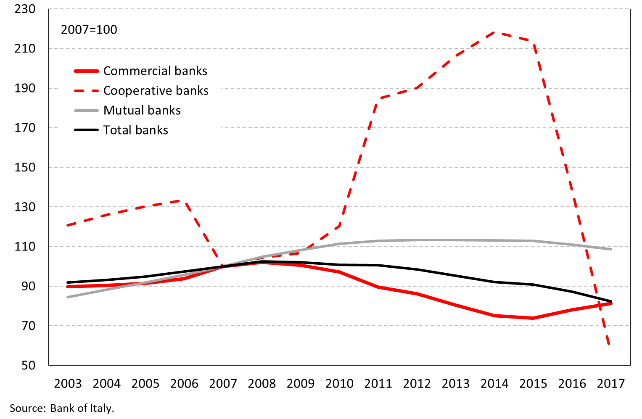 The same phenomenon, on an even bigger scale, affected the mutual banks (banche di credito cooperativo; 6.6% of total loans). Mutual banks grant credit primarily to their members, reflecting their mutualistic nature and the regulatory restrictions on geographical expansion. Their shares are non-tradable: they do not reflect the value of the company, as profits are mostly allocated to a reserve fund. Cooperative banks’ shares are instead listed on the stock exchange and only 10% of their profits have to be paid to the reserves. In both cases, non-members can hold shares and they can enjoy property rights attached to the shares, but they cannot vote or exert rights of control. The voting rule is one member-one vote. In both cases, ownership rights are limited and institutional investors may hold only up to 10% of the capital. New membership applications have to be approved by the board. This governance structure impinged on the ability of banks to respond effectively to a crisis, especially by hampering their capital-raising potential at a time of distress, not providing adequate incentives to control banks’ management and complicating the bank resolution process. 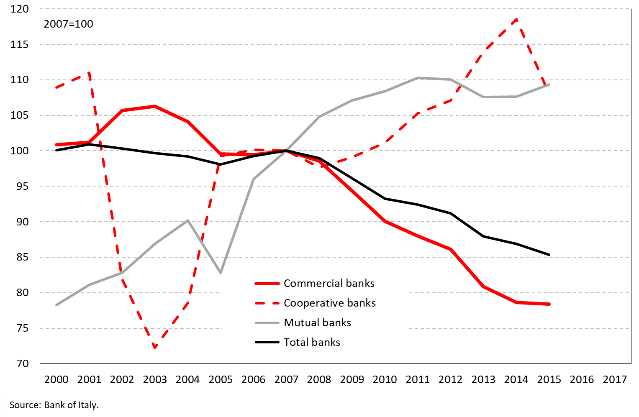 In the early years of the financial crisis (2008-2009), cooperative banks gave continuity to the loan supply thanks to their financial strength and funding stability, although, by the second half of 2011, they suffered from a liquidity shock. In October 2011, the net interbank position of the cooperative sector was negative for the first time. Cooperative banks also experienced a sharp deterioration in credit quality. The reforms of cooperative banks launched in January 2015 by the Italian government addressed most of the governance issues. In March 2015, the government approved a law that provided strong incentives for the ten largest cooperative banks to transform themselves into joint stock companies. The merger between Banca Popolare di Milano and Banco Popolare, which created Italy’s third-largest domestic bank, is a direct consequence of the reform. In February 2016, the cabinet of ministers approved the reform of the mutual banks. The reform permitted the establishment of parent companies, with the controlling majority owned by the cooperative banks themselves. Mutual banks had to either adhere to a parent company group or transform themselves into joint stock companies. The parent company manages strategic coordination, supervision, and risk management, as well as the raising of funds in financial markets for the whole group. The reform aims at strengthening the Italian mutual banking sector, improving access to capital market funding and enhancing the governance profile. Since then, three groups have developed, and the implementation of the reform is underway. Consolidation helps correct overcapacity in the banking sector, and the creation of larger entities allows for greater economies of scale, all of which helps efficiency and profitability, although severance payments due to cuts in personnel depress profitability in the near term. Finally, this new governance helps to improve the allocation of resources within the economy. The role of banking foundations has also changed during the crisis. Eighty-eight banking foundations used to hold a significant equity share of the banking sector, with the first two accounting for one-third of the total foundations’ holdings. These foundations appeared during the 1990s when Italy started a process that transformed state-owned banks into public companies. Banking foundations used to exert some influence on the major decisions made by banks through their role as reference shareholders with representation on the boards of directors. Politicians in municipalities, provinces and regions typically appointed the advisors and managers of foundations and thus they exerted a considerable influence on the major decisions. As a result, politicians indirectly controlled banks as they appointed board members of foundations, who in turn sit on the boards of the banks. The capitalisation of Italian banks was among the lowest in Europe before the crisis. The preference of banking foundations for a stable stream of dividends to finance social projects reduced financial flexibility and the ability of banks to recapitalise themselves through internal cash flows during the crisis. This phenomenon put banks under pressure at a time when European rules forced them to increase capital; foundations were not in a position to provide it. Most of the foundations’ revenue streams came from dividends paid by banks, and foundations mostly used to invest rather than save these streams. Furthermore, the presence of foundations and the nature of the interests they represent might have discouraged the arrival of private investors with fresh capital. In other words, their interests were not fully aligned with those of investors willing to maximise shareholders’ value over the long term, but rather concentrated on the objective of preserving the stream of dividends and possibly exerting power in the allocation of resources locally. In April 2015, the Ministry of Finance and ACRI, the Association of Italian Savings Banks and Foundations, signed a Memorandum of Understanding forbidding foundations from investing more than 33% of their equity in any single asset class. Also, new European rules imposed that part of banking capital was to be used as reserves in case of crisis, and this inevitably reduced the payout ratio. In 2008, just before the financial crisis, foundations received 2.3 billion euros as dividends from banks, i.e. the highest payout ratio since 2000. In 2015, this amount declined to 394 million euros. In the meantime, foundations reduced their stakes in Italian banks substantially, mostly because of capital dilution. The ratio of dividends paid to foundations in total moved from 15.7% in 2008 to 2.9% in 2015. By now, the role of foundations in the Italian banking sector is far smaller. The share of NPLs over total loans was low before the financial crisis and below 3% in 2006-2008. The quality of lending began to worsen in 2009, and then deteriorated each year through 2016, and especially after the sovereign debt crisis that started in 2011, in step with the contraction of the Italian economy. Several factors contributed to a rising NPL stock: over-indebted corporates following the sharp crisis-related drop in output, a highly complex legal system of corporate restructuring and insolvency, lengthy judicial procedures, and a tax system that until recently discouraged NPL write-offs. The decrease in bad debt net inflows (down from 24.7 billion in 2015 to 10.8 billion in 2016 and -19.6 billion in 2017) is mainly related to the recovery of the economy and NPL internal management by banks. Securitisation and sales of NPLs increased from 7.1 billion in 2015 to 17.9 billion in 2016 and 38.7 billion in 2017. The combined effect of these flows has allowed for a reduction in the stock of NPLs. In December 2015, they were 200.7 billion. They stayed broadly unchanged at 200.9 billion at the end of 2016, but they declined to 167.4 billion at the end of 2017 and to 127.5 billion in July 2018. Despite the pace of write-offs having increased significantly and despite the fact that loan loss provisions cover more than half of the total amount, the stock of NPLs as a percentage of total loans remains high (see Figure 4). NPLs had an adverse feedback effect on the macroeconomic environment through their impact on the lending capacity of banks. The supply of credit was affected as banks locked in capital and funding in the financing of non-productive assets. This phenomenon reduced the balance sheet room available for new lending. Furthermore, NPLs reduced the profitability of banks, which over time weighed additionally on the loan supply through higher funding costs and increased credit constraints. The low market value of Italian loans stems mainly from the lengthy period required to repossess collateral, which in some cases can take several years, buyers’ more cautious collateral valuations and higher investors’ return hurdles. Italian authorities have implemented new measures aimed at improving the efficiency and speed of judicial and extrajudicial insolvency procedures to facilitate the reduction of bad loans on the balance sheets of banks. Moreover, in April 2016 the Italian government introduced further amendments to the insolvency and foreclosure framework aimed at reducing the time necessary for recovering collateral. In particular, it launched a digital register on judicial property foreclosures and insolvency proceedings that improves the availability of information for the valuation of NPLs. The development of a secondary market for NPLs should help banks to continue moving bad loans off their balance sheets and improve the loan recovery values by providing a more cost-effective alternative to internal NPL management, especially for smaller banks or banks with scattered loan portfolios. Government measures to speed up foreclosures were positive but only affected new or renegotiated loans rather than materially reducing the existing stock of bad loans. To sum up, Italian banks’ profitability and capital adequacy have been under pressure since the start of the crisis. Banks have initially responded to a lack of funding via capital increases to refinance NPLs, trying to avoid or delay loss recognition or sale, and the related squeeze in their profit margins. Only under the pressure of European authorities in 2015 did Italian banks start to unveil the full extent of the NPL problem. A bird’s-eye view of Italian banking problems shows that most of them were direct consequences of the government debt crisis, the supply-side credit crunch that followed, and the downturn in the economy. A negative loop further depressed the performance of the economy and, in turn, affected the quality of banks’ credit portfolios. The timing and the characteristics of the BRRD introduction exacerbated the difficulties in addressing the issues via government intervention. Moreover, the governance of cooperative and mutual banks, and the role of banking foundations, also contributed to the banks’ sub-optimal response to the crisis. Currently, most reforms are in place and, among other benefits, they favour a reduction in the stock of NPLs. So far, however, the reduction remains somewhat short of the desired pace. The next recession may arise even before Italy adequately addresses its remaining vulnerabilities. Lorenzo Codogno is Visiting Professor in Practice at the LSE’s European Institute and founder and chief economist of his own consulting vehicle, LC Macro Advisors Ltd. Prior to joining LSE, Lorenzo Codogno was chief economist and director general at the Treasury Department of the Italian Ministry of Economy and Finance (May 2006-February 2015). Throughout this period, he was head of the Italian delegation at the Economic Policy Committee of the European Union, which he chaired from Jan 2010 to Dec 2011, thus attending Ecofin/Eurogroup meetings with Ministers. He joined the Ministry from Bank of America where he had worked over the previous 11 years. He was managing director, senior economist and co-head of European Economics based in London. Before that, he worked at the research department of Unicredit in Milan. Mara Monti is Visiting Fellow at the LSE’s European Institute and a journalist at Il Sole 24 Ore, Italy’s leading financial/economic newspaper, based in Milan. She completed an MSc (Econ) in Politics of the World Economy at LSE career in journalism, specialising in the financial sector. Over the past 16 years, she has been part of the financial team at Il Sole 24 Ore, writing extensively on financial issues, sovereign crisis and monetary policy issues. She wrote several books investigating the bankruptcy crisis of the past ten years and probing into financial scandals. • The article tells the story of the Italian economy for the last 10 years, with a focus on the banking sector, its fragility and the government’s responses. • However, there is no trace throughout the article of comparisons of the Italian economy with these neighbouring countries. Moreover, the article describes the responses of the government that, as they state, led to improvements rather than worsening – though maybe not sufficiently on time or not sufficiently effectively as of now.